View Interactive Maps showing topography, geology, and natural resources. Maps are an essential tool for conveying information about natural resources, geologic hazards, and geologic history. 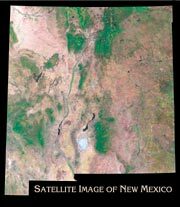 One important role of the New Mexico Bureau of Geology & Mineral Resources (NMBGMR) is in the production and distribution of geologic and other types of maps. Many of our staff are involved in map production through our STATEMAP program and our Cartography/GIS group is responsible for producing the finished products. Topographic maps show the terrain and are often used as a base for other maps (we carry a complete collection of NM topo maps). If you have a GPS receiver, you might find our free GPS overlay grids helpful. Our Memoirs, Bulletins, and Hydrologic sheets are another source for geologic and other types of maps as well as detailed geoscience research. A simplified geologic map of NM. A portion of an oil and gas pool map. Topographic map of the Strawberry Peak near Socorro, NM.